Yes…we know you’ll say sounds or music are annoying when you open a new website in your browser. We agree. But in some cases, adding sounds or music to a website will make it special and increase its value! That is why we selected 22 websites that use background music or sounds masterful! These websites were created for music or artistic niches, and sounds fit in gracefully in the designs. These music-themed website designs will inspire you – whether it’s the typography, color palette, graphic elements arrangement or layout interpretation, you will notice something special at each and every one of these creative websites. What do you think? Have you ever used sounds in a website design? Let us know in the comment section below! Relax, they’re the good guys and they have a pretty awesome website. It has a black and white animated design layout and it also uses a background sound! This site’s homepage has very clear headlines and a simple, but effective design. The right info stands out, making it easy for the visitor to understand what this site is all about. Blast is a colorful website with a bold background sound that gives this page personality, making it look and sound bold and creative! This website presents the journey of Amy Winehouse and her beautiful music. If you’re a fan, go ahead and analyze this website, listen to her music and get inspired. The homepage looks gorgeous. It catches your attention with the full-screen video and it is also very intuitive and user-friendly. More Hazards is a Nashville folk duo and this website focuses on presenting their music in a creative way. The website has a creative and colorful design with a homepage that impresses through high-resolution illustrations and intriguing background music. John Iacoviello is a software developer and this website definitely suits him. My Static Self is his personal portfolio website that also uses background sounds. 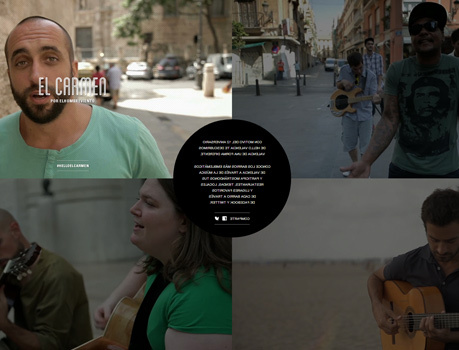 This homepage design amazes through its simplicity and a great selection of music. With a little creativity and compelling illustrations, you can surely change a website’s image and increase the impact it makes on your visitors! This is a great example! Fournasetti has a delirious animated background and uses some really nice background music. The pattern changes as you click on it. 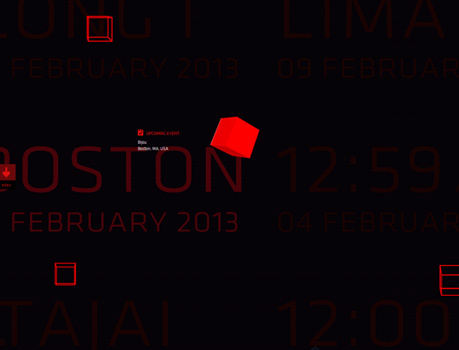 Melas’s website has an interactive abstract background that makes the triangle shapes move as you hover on them. When they move they also make a sound. This website has a simple, but content-rich homepage as well, due to its awesome scrolling function. This makes it easy for the user to read through the content, without clicking on too many links. Calvin Harris’ newest album is out and you can have a sneak peek on his website. Enter it and listen to his music. Pivovarov is a musician and he has some really nice music which you can listen on this website. His website can definitely inspire you and so can his music. On this website, you can see and buy Chris Taylor’s creative projects. The website looks modern and elegant. It uses a simple dark background and large thumbnail photos for each project. The Hashima Island is a Google project that presents the forgotten world of an abandoned island which is situated at about 15 miles from Nagasaki. This island is a symbol of Japan’s rapid industrialization. The website introduces you into this world through black and white Google navigation and subtle scary sounds. Wayne McGregor is an award-winning choreographer and this website presents his work and his teams’ through sounds, images and text. Janis is a fashion website that uses calm music, such as the ones you hear at the mall, in clothing stores. This website uses a simple full-screen background image and a minimalist menu bar at the bottom of the page. The Build Film also uses sounds on their website. This is an interactive film project exploring the world of custom motorcycle making through the stories of 3 different motorcycle builders. Besides the cool preloader which will definitely grab your attention, this website uses a series of animations and background sounds which will definitely inspire you. This is a sound experiment which was created for the Venice Biennale. It was created by Xavier Veilham and it represents the French Pavilion. Studiogusto is a creative agency that puts culture and creativity first. This agency has a really nice animated website that uses computer background sounds and short films. This is Charlie Gleason’s website. He is both a musician and a programmer and he has an awesome website which will definitely inspire you in your next project. It presents his music and programming skills in a creative way. The website uses full-screen videos on which lyrics come up as he sings. Bold texts, simple typography, colored backgrounds and unique images, this is what makes a great homepage design. Instant Love celebrates songs through a colorful website. You can listen to many songs on this website and get inspired. You can scroll through artists and genres until you find that song you were searching for. This website user a modular grid layout in a creative way. It divides the page into 4 equal parts and each part has an image of a different singer. Hover your mouse over the images and you’ll notice they are in fact videos of people singing. This website was specially created for a band called Dubfire. It combines futuristic/abstract illustrations with subtle animation effects and does it successfully! The website uses a simple black background and overlays geometric vector elements in its design layout. Each cube contains information about the band and as you hover your mouse over different cubes you’ll find out more about the band. Cubes turn fully-red when hovered over and they make a sound. This website has a simple, light-toned color palette and a unique illustration on the homepage. It contains a portfolio of hand-drawn creatures, with each creature having its own particular sound! I Don’t put background music on my website. Everyone has different tastes in music.